Now don't suppose that there are only bare white sands at the bottom of the sea. No indeed! The most marvelous trees and flowers grow down there, with such pliant stalks and leaves that the least stir in the water makes them move about as though they were alive. . . From the deepest spot in the ocean rises the palace of the sea king. Its walls are made of coral and its high pointed windows of the clearest amber, but the roof is made of mussel shells that open and shut with the tide. This is a wonderful sight to see, for every shell holds glistening pearls, any one of which would be the pride of a queen's crown. If the Sea King were to eat cake, I'm sure this is what he would choose. A delicate sea shell, crisp and golden on the outside. Inside, a fine and sweet crumbly cake, dripping with a light, lemon glaze, and showered in the finest salt of the sea. There's something so romantic about a Madeleine. 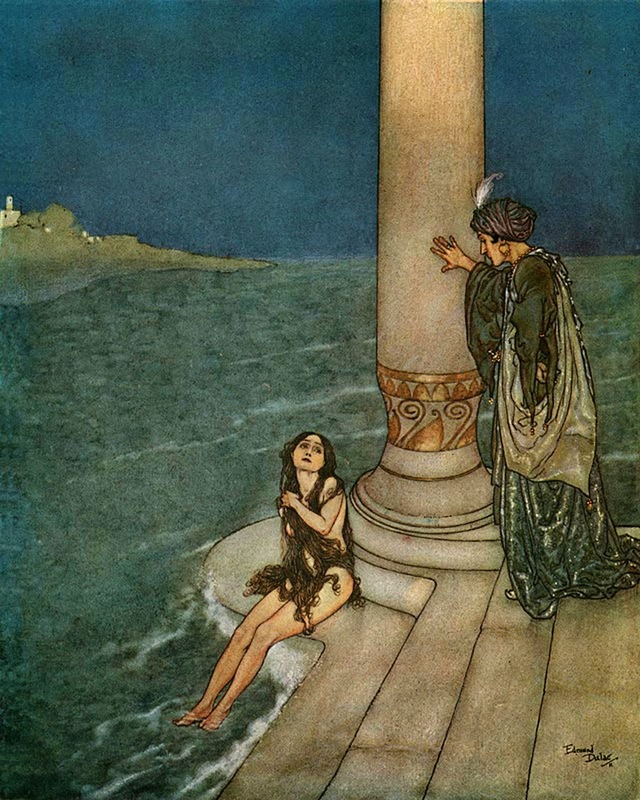 As a child I was fascinated by the fairy tale, The Little Mermaid. I discovered it one day while digging through my grandparent's library (a beloved childhood pastime). There, high on a shelf among the more modern books, stood a forest-green, fabric-bound tome, with flourishing gold script along the spine - Andersen's Fairy Tales. Being a lover of antique books, I was drawn to it and climbed atop a chair to reach it. I blew the dust from the top. Inside were the most beautiful, full-colour engraved illustrations! I was immediately captivated by the story of The Little Mermaid, long before Disney's animated version. Like the essence of a long forgotten memory that flutters in the back of my mind, I occasionally recall the magical story, and with it the musty smell of the library, the way the dust in the air sparkled like starlight in the beam of sun streaming through the high window, the feel of the thick pages, stained with age and crumbling between my small fingers. Perhaps that's why I love these Madeleines. Like the shells on the palace roof, they would be right at home on the Sea King's splendid table. Are they a cookie or a cake? No one can decide. But the idea of having a cake all to myself is so much more decadent than having just a cookie, so I prefer to think of them as tiny, little cakes. Traditionally, Madeleines are made with ground nuts. Not mine! Not only are they nut-free, but I use King Arthur's Gluten-free flour mixture. Madeleines may look intimidating, but they are so easy to make! Really, the only piece of special equipment needed is a Madeleine pan. Just be sure not to over-fill the molds or you'll have a lopsided shell that is burnt around the edges. A tablespoon of batter in each mold is all you need. After they've cooled, they're dipped in a dripping, lemony glaze and then sprinkled with a pinch of fleur de sel or the finest French grey sea salt. 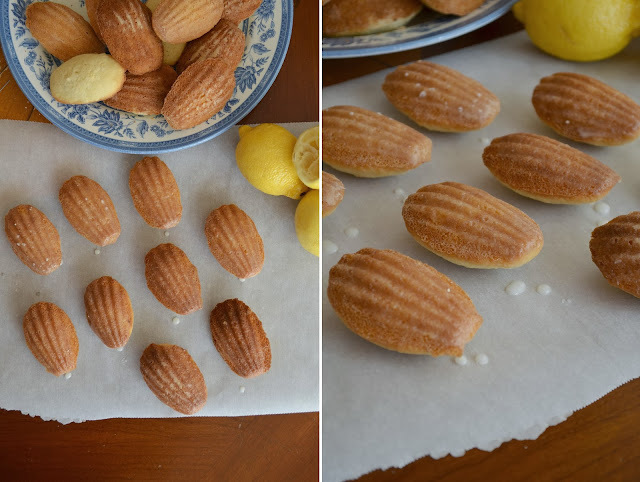 A taste of the sea for these mermaid inspired Madeleines! Preheat your oven to 375 F (190 C). In a large bowl, beat the eggs and sugar until frothy. Add the vanilla and the zest of the lemon (reserve the lemon juice for the glaze). Beat in the g.f. flour, baking soda, and salt. Melt the butter in a small bowl. Slowly beat in the melted butter, leaving about a teaspoon in the bowl to grease the pan. 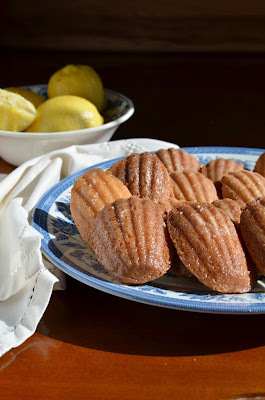 Using the remaining butter, brush the Madeleine molds, and dust them with a little gluten-free flour. Place approx. 1 tablespoon of batter into each mold. Don't overfill the molds or the edges will burn and the cakes will be misshapen. Bake for 12 - 15 minutes until the edges are golden and the cakes are firm in the middle. Cool for a minute in the pan, then use a fork to carefully slide them out of the pan and on to a plate. To make the glaze, juice the lemon into a small bowl. Add the icing sugar and whisk until smooth. (Depending on how juicy your lemon is, you may need more or less icing sugar. The glaze should be thick but pourable.) Hold each cake by the smooth side and carefully dip the shell-shaped side in the glaze. Allow the extra glaze to drip back into the bowl and place on a sheet on parchment paper to dry. While the glaze is still wet, sprinkle with just a pinch of French grey sea salt. Serve as soon as the glaze has set. Like this recipe? 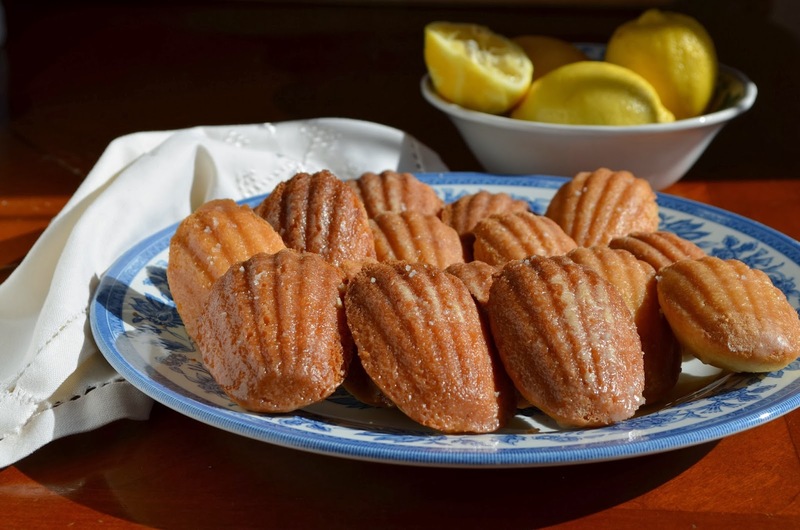 You might also like these Gluten-Free Raspberry Madeleines, or maybe these Gluten-Free Chocolate Cinnamon Madeleines.